The deep relationship between the United States and Mexico has had repercussions felt around the world. This sweeping and unprecedented chronicle of the economic and social connections between the two nations opens a new window onto history from the Civil War to today and brilliantly illuminates the course of events that made the United States a global empire. The Mexican Revolution, Manifest Destiny, World War II, and NAFTA are all part of the story, but John Mason Hart's narrative transcends these moments of economic and political drama, resonating with the themes of wealth and power. Combining economic and historical analysis with personal memoirs and vivid descriptions of key episodes and players, Empire and Revolution is based on substantial amounts of previously unexplored source material. Hart excavated recently declassified documents in the archives of the United States government and traveled extensively in rural Mexico to uncover the rich sources for this gripping story of 135 years of intervention, cooperation, and corruption. Beginning just after the American Civil War, Hart traces the activities of an elite group of financiers and industrialists who, sensing opportunities for wealth to the south, began to develop Mexico's infrastructure. He charts their activities through the pivotal regime of Porfirio Díaz, when Americans began to gain ownership of Mexico's natural resources, and through the Mexican Revolution, when Americans lost many of their holdings in Mexico. Hart concentrates less on traditional political history in the twentieth century and more on the hidden interactions between Americans and Mexicans, especially the unfolding story of industrial production in Mexico for export to the United States. Throughout, this masterful narrative illuminates the development and expansion of the American railroad, oil, mining, and banking industries. Hart also shows how the export of the "American Dream" has shaped such areas as religion and work attitudes in Mexico. Empire and Revolution reveals much about the American psyche, especially the compulsion of American elites toward wealth, global power, and contact with other peoples, often in order to "save" them. These characteristics were first expressed internationally in Mexico, and Hart shows that the Mexican experience was and continues to be a prototype for U.S. expansion around the world. His work demonstrates the often inconspicuous yet profoundly damaging impact of American investment in the underdeveloped countries of Latin America, Asia, and Africa. 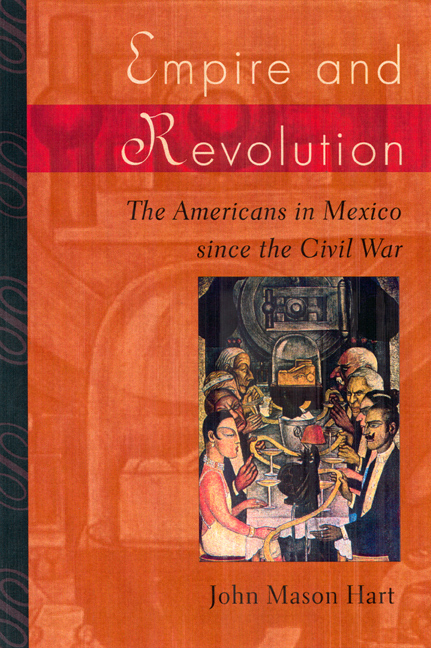 Empire and Revolution will be the definitive book on U.S.-Mexico relations and their local and global ramifications.